1980 US OPEN - "JACK IS BACK!" With his second U.S. Open victory at Baltusrol, Jack Nicklaus won his fourth Open and became the first player to win a major in three different decades. Right from the beginning, Jack Nicklaus appreciated the lower course at Baltusrol Golf Club, calling it "... marvelously fair and exceptionally challenging. a pure test of golf." After a disappointing 1979, Nicklaus totally revamped his swing with the aid of long-time instructor and friend Jack Grout. 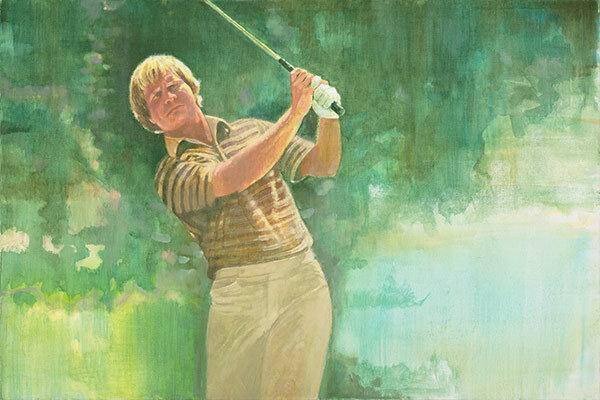 A rejuvenated golden bear opened the 1980 U.S. Open with a 63, sharing the lead with Tom Weiskopf and tying the U.S. Open 18-hole record set by Johnny Miller in the final round of the 1973 open at Oakmont. He turned in a 71 on Friday to lead Japan’s Isao Aoki by two. On Saturday, he bogeyed nos. 14 and 15 and ended the day tied with Aoki for the lead. Nicklaus took a two-stroke lead to the 17th hole on Sunday. Both Nicklaus and Aoki – paired for all four days of that open – closed with birdies on the last two holes, and when Nicklaus putted out for his victory, the gallery began chanting, "Jack is back! Jack is back!" and indeed he was, setting an open scoring record of 272 (breaking his own record) and joining Willie Anderson, Bob Jones and Ben Hogan as the only four-time winners of the national championship.